The Brazilian National Championship kicked off yesterday afternoon which makes my report at least one day late. Sorry about that! Better late than never, right? In my report, I give a short comment on each of the twenty teams and my prediction about where they will finish in the league table. For a full explanation on Brazilian football and all of the club competitions see this link. By giving my predictions I am of course opening myself up to endless ridicule but I’ve already made my excuses just in case it all goes wrong. More about that in a separate report though. Inter have the most stable and settled squad in Brazilian football which combines a mixture of youth and experience. Unlike last year when they rested players in the opening rounds of the Brazilian Championship due to their successful Libertadores campaign, this year they will want to fly out of the blocks. Their Argentine midfield trio of Guiñazú, Bolatti (ex-Fiorentina) and D’Alessandro are probably the best in the league. Leandro Damião is a goal machine up front and the defence is settled and steady. Renan their goalkeeper looks a little dodgy though. There are some question marks over coach Falcão after a surprise Libertadores elimination but the team bounced back in style by beating Gremio in the Gaúcho State Championship final. Despite these two question marks, I think their quality in depth will see them run out as league winners come December. I was really enjoying following Cruzeiro until I realised their coach Cuca was a thug. Thug or not, he is doing a good job and Cruzeiro are one of this year’s firm title favourites. They were in cruise mode in the Libertadores until the street wise Colombians of Once Caldas knocked them off their f*cking perch (to quote a certain Manchester United manager). 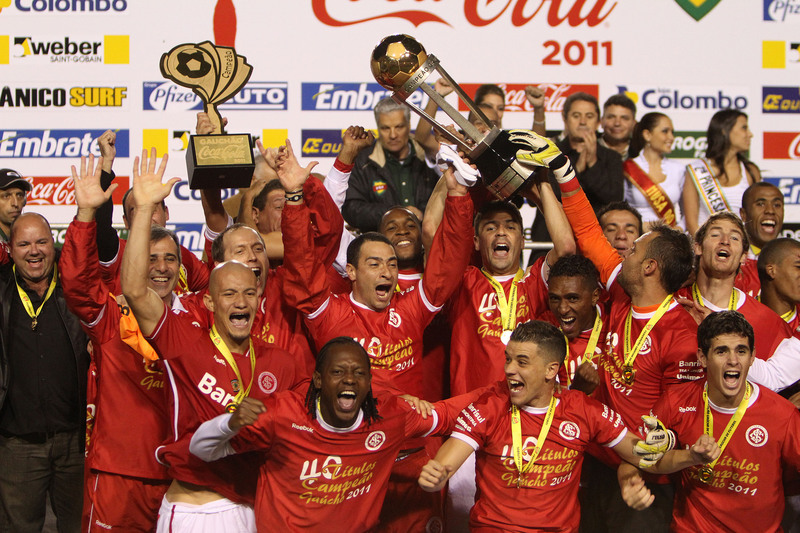 Like Internacional, they bounced back well from that defeat and took their State Championship. Man for man, not as strong as Internacional though. Expect them to fly out of the blogs and fade later in the year. Cuca has a reputation as a bottler. The strongest team in Brazil with the best coach (Muricy). So why third place? The answer to that is the fixture calendar. Physically exhausted after trips to Mexico and Colombia in the Libertadores, in between match after match in the State Championships. Muricy will rest his entire starting 11 on the opening day of the season in the match against fellow title rivals Internacional. Can you imagine Arsenal vs. Manchester United on the opening day of the season and Arsene Wenger rests his entire starting 11? Unthinkable. It’s a weird calendar because the Brazilian Cup, Libertadores and State Championships all reach a crucial phase just before the start of the National Championships. Rather than rest his players in the São Paulo State Championship, Muricy has chosen to do it on the first day of the national league. Expect more players rested if Santos get to the final of the Libertadores. This is exactly what happened with Internacional last year. Santos would also obviously suffer if their two stars (Neymar and Ganso) leave the club. One of the strongest and most solid teams in Brazil but outclassed by a tired Santos in the São Paulo State Championship final. Their problem in the last year or so has been a lack of creativity and shortage of goal scorers. They have taken a big step to solving that by signing Alex and Adriano. BUT, Alex will only be joining from Spartak Moscow 14 matches into the competition and Adriano is injured and there are huge questions marks over his mental and physical state. They have also lost some key players since last year when they finished 3rd: Roberto Carlos (Anzhi), Elias (Athletico Madrid), Ronaldo (retired), Bruno César (Benfica) and Dentinho (Shakhtar). Okay, the last name was a joke! If they don’t get off to a good start, Tite’s days as coach could be numbered. One of the strongest and most expensive squads in Brazil. But, it’s not balanced. Desperately need a left back and a striker. Also could do with a centre back. Ronaldinho has yet to justify his hefty salary both on and off the field. The jury is out. Thiago Neves has been on sensational form and deservedly received a call up to the seleção. I’m not a fan of their coach Vanderlei Luxemburgo despite his success in this competition (he has won the Serie A title five times). Desperate to sack their coach Carpegiani but nobody to replace him with. Good squad but like Flamengo it’s unsettled and missing something. Key signing and São Paulo idol Luis Fabiano has just undergone knee surgery and it isn’t clear when he’ll be able to make his debut. Some promising youngsters including Casemiro, Lucas, Willian Jose, Henrique, etc. Ex-world-player-of-the-year Rivaldo is in their squad but doesn’t get many chances on the pitch. Miranda is also leaving for Athletico Madrid in June. Have had a really good start to the year except for one disastrous week where they lost to Corinthians and then were thrashed 6-0 by Coritiba in the Brazilian Cup. Big Phil is a good coach but thanks to that week is under pressure. Given time, I think he can turn it round. Star player Valdívia is more interested in the São Paulo nightlife than playing football according to the club president and is also constantly on the treatment table. Precarious financial situation means any big name signings are unlikely. Watch out for Marcos Assunção free kicks. Rebuilding after Vanderlei Luxemburgo’s disastrously expensive time at the club. They now have a good coach in Dorival Junior (ex-Santos) but no star players. The best is winger Mancini. A few decent youngsters coming through I’m told but I haven’t had the chance to see them play yet. Will sorely miss Diego Tardelli who has left for Anzhi. Last year’s Champions but have lost Muricy who was fed up with the team’s training facilities. New coach Abel Braga has his work cut out after some disastrous displays by Fluminense in the Rio State Championships and Libertadores. Conca – last year’s player of the year in Brazil – is oddly off form. Fred’s goals are their main hope. A big team but just don’t seem to have the players. Watch out for 18 year old striker Leandro, Grêmio’ s very own Neymar. Pressure is building on coach Renato Gaúcho after Libertadores elimination and defeat against Internacional in the State Championship. To get any higher than 10th, somebody is going to have to open the cheque book. Fábio Rochemback (ex-Barcelona and Middlesbrough) plays here. Anybody remember him? He’s still quite good if you ask me. Promoted from the Serie B and recently went on a 24 game winning streak. That will not continue in the Serie A and they may struggle against better opposition. A few defeats and their confidence could go. But that 6-0 thrashing of Palmeiras has convinced me that they won’t have to worry about relegation. A good team and they have been improving this year after a disastrous start in the State Championships. If they play the way they can, they could get into the top 5. They struggled against Atlético-PR in the Brazilian Cup recently and again at home to Avaí and it gives me a funny feeling that after so many years of underperformance, the team’s confidence is still very fragile. A few defeats and the fans are on their back, sack the coach, change the squad, etc. I could be wrong. A lot will depend (i.e. their confidence) on how they do in the Brazilian Cup. You just never know what to expect and they quite often exceed expectations. Currently in the shadow of their prolific neighbour Coritiba, expectations are lower than usual. Kléberson (ex-Manchester United) plays here. Good cup team and hard to beat at home in the hot and humid north of the country. Could surprise a few people as they did with Flamengo recently in the Brazilian Cup. No star players and yet another team that is strong at home. Like Ceará, they play in a small, cramped stadium. Even the best teams in Brazil hate playing there, especially on those rainy winter days. The problem is their away form. Great at home and useless away. I’m starting to notice a trend here with these teams from outside São Paulo, Rio, Porto Alegre and Belo Horizonte…. Key player: do they have one? Almost qualified for the Libertadores last season but bottled it at the end. Knee jerk reaction from club management who sacked Joel Santana who has been doing a great job. There is always one big club that struggles and this year I think it’ll be Botafogo. They have a very good goalkeeper in Jefferson. All his powers will certainly be needed. Promoted from Serie B last year. Other than that, don’t know much about these guys, I’m afraid. Key player: Their goalkeeper, whoever he is. This entry was posted in Serie A and tagged Adriano, Alex, América-MG, Atlético, Atlético Mineiro, Atlético Paranaense, Atlético-GO, Atlético-PR, Avaí, Bahia, Big Phil Scolari, Bill, Bolatti, Botafogo, Brazilian National Championship, Carpegiani, Ceará, Conca, Corinthians, Coritiba, Cruzeiro, Cuca, Davi, D’Alessandro, Dorival, Dorival Junior, Douglas, Falcão, Felipe, Figuierense, Fluminense, Fred, Grêmio, Guiñazú, Iarley, Internacional, Jefferson, Kléber, Kléberson, Leandro, Leandro Damião, Liedson, Loco Abreu, Luis Fabiano, Mancini, Marcos Assunção, Marquinhos, Miranda, Montillo, Muricy, Neymar, Palmeiras, Paulo Baier, predictions, Rivaldo, Rochemback, Rogerio Ceni, Ronaldinho, Santos, São Paulo, Serie A, Valdivia, Vanderlei Luxemburgo, Vasco by Brian Davidson. Bookmark the permalink.